Not to be confused with Lotus Elite. The 1996 Lotus Elise weighed 725 kg (1,598 lb). Because of this low weight, it was able to accelerate 0-60 mph (97 km/h) in 5.8 seconds despite its relatively low power output of 118 bhp (88 kW; 120 PS). Braking and fuel consumption are also improved by the car's reduced weight. Cornering is helped by a low center of gravity height of 470 mm (18½"). Series 1 was designed by Julian Thomson, then head of design at Lotus, and Richard Rackham, Lotus's chief engineer. Besides the standard higher-performance variants listed below, Lotus also released some limited edition models such as Sport 135 (1998/9) with approx 145 bhp (108 kW; 147 PS), Sport 160 (2000) with 150–160 bhp (112–119 kW; 152–162 PS), and Sport 190 (190 bhp (142 kW; 193 PS)). These were more competent on track with sports suspension, wheels and tyres, seats according to model. There were other special editions such as the 50th Anniversary Edition (green/gold) celebrating 50 years of Lotus cars, the Type 49 ("Gold Leaf" red and white two-tone), and Type 79 ("JPS" black/gold) which refers to its successful Grand Prix car type numbers. The Series 1 Lotus Elise 80 was briefly assembled on a dedicated assembly line at Proton's Shah Alam factory between 1997 and 2000. The Malaysian-assembled Elise costs less than its British-built counterpart as it was manufactured with more Malaysian-sourced components. The Malaysian-assembled Elise was also exported to regional markets, including Japan, Hong Kong, Australia and New Zealand. However, parent company Proton had been severely affected by the 1997 Asian financial crisis, which brought an early end to the Malaysian assembly of the Lotus Elise in late 2000, only three years after it commenced and with an estimated 150 units sold. The Proton-assembled Elises were assigned the code 'B' in the eleventh VIN position, while the original Hethel-built units were stamped with the code 'H'. In 2000, the 340R limited edition model, based on a Series 1 Elise was introduced. This roofless car was a special edition, limited to only 340 cars being built. The name 340 originally referred to the 340 bhp/tonne (254 kW/tonne) power-to-weight ratio of the original prototype which had 177 bhp (132 kW; 179 PS) while weighing just 500 kg (1,102 lb). However, in production models the 340 refers to the number of cars built. The final production versions weighed 701 kg (1,545 lb) and had a power-to-weight ratio of 252.5 bhp (188.3 kW)/tonne. A "Track Pack" was created that upped power to 192 bhp (143 kW; 195 PS) and weighed only 571 kg (1,259 lb). In 2000, Lotus introduced the Exige — a hardtop version of the Elise with the 177 bhp (132 kW; 179 PS) engine from the 340R; as well as different front and rear body "clamshells", larger wheels, and a rear wing. Many models received an upgrade to 190 bhp (142 kW; 193 PS) with better driveability due to changes to ECU and cam timing. The Series 1 could not be produced beyond the 2000 model production year due to new European crash sustainability regulations, so Lotus needed a development partner to meet the investment requirement for a Series 2 car. General Motors offered to fund the project, in return for a badged and GM-engined version of the car for their European brands, Opel and Vauxhall. The Series 2 Elise, announced on 9 October 2000, was a redesigned Series 1 using a slightly modified version of the Series 1 chassis to meet the new regulations, and the same K-series engine with a brand new Lotus-developed ECU. The design of the body paid homage to the earlier M250 concept, and was the first Lotus to be designed on a computer. Both the Series 2 Elise and the Opel Speedster/Vauxhall VX220 were built on the same production line, in a new facility at Hethel. Both cars shared many parts, including the chassis, although they had different drive-trains and power-plants. The VX220 carried the Lotus internal model identification Lotus 116, with the code name Skipton for the launch 2.2N/A version and Tornado for the 2004 introduced 2.0 L Turbo. Fitted with 17 inch over the Elise's 16 inch front wheels, the Vauxhall/Opel version ceased production in late 2005 and was replaced by the Opel GT for February 2007, with no RHD version for the United Kingdom. Basic S2 models had a naturally aspirated 1,795 cc (1.8 L; 109.5 cu in) Rover K-series engine without VVC rated at 120 bhp (122 PS; 89 kW) at 5600 rpm and 124 lb⋅ft (168 N⋅m) at 3500 rpm of torque. The Series 2 was also available as a 111S model, with the VVC engine Rover technology producing 160 hp (119 kW). The 111S models were discontinued in 2005 in favour of the Toyota powerplant. It is believed that the switch to a Toyota engine was due to federalising issues with the Rover powerplant in the USA, however this has been largely unproven with little information released from Lotus as to the exact reasons. As of the time of the switch the Rover engine would still have met the standards required of it for use in America. Two more track-focused models, the 135R and Sport 190, were available with 135 bhp (101 kW; 137 PS) and 192 bhp (143 kW; 195 PS) respectively. These also came with associated handling upgrades such as Lotus Sport Suspension and wider wheels with Yokohama Advan A048 tyres. In certain markets, the 135R was replaced by the "Sport 111", which was similar, apart from sporting the 156 bhp (116 kW; 158 PS) VVC engine in place of the 135 bhp (101 kW; 137 PS) tuned K-series. This Series 2 Elise model comes in a European 111R version or a version sold in North America, called the Federal Elise. It is powered by the all-aluminium alloy 189 hp (192 PS; 141 kW) 1.8 L (1,796 cc) DOHC Toyota ZZ engine with a Yamaha designed twin-cam head offering variable valve timing on both intake and exhaust valvetrain and a Toyota C64 6-speed manual transmission. Many tests show performance of 0–60 mph (0–97 km/h) in approximately 4.9 seconds, or 4.7 seconds with the Sport Package. The engine management computer is a Lotus programmed unit. The 2005 Lotus Elise was the first to be sold commercially in the United States, in the summer of 2004. Approval for the Elise, however, required intervention by the National Highway Traffic Safety Administration (NHTSA) which provided a three-year exemption for the car, as it had failed to meet US bumper and headlight regulations. The first-year model suffered from a few flaws, most notably a design flaw in the headlamps that magnified the sun’s light, allowing the inside of the lamp housings to be melted by the sun. This model was followed up by the 2006 Model Year Elise 111R and SportRacer models. Lotus made a limited edition (50 in the US) version called the Lotus Sport Elise. 2006 models differ from the 2005 models in a few aspects. 2006 models sport LED tail lights, drive by wire (an updated ECU), improved fuel consumption, and more comfortable ProBax seats. For the 2007 model year Lotus several minor changes were made. The LOTUS decals on the rear of the vehicle, previously flat stickers, were replaced by raised lettering. The headlamp units were sealed. Also, in order to comply with US Federally mandated bumper restrictions, the frontal crash structure was slightly changed and rear bumperettes were added next to the licence plate mount. Approximately 100 2007 model year "launch" cars were shipped to the US without these bumper changes. 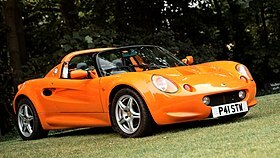 Also in 2007, the Elise S was released and the 111R renamed Elise R. All Lotus Elise cars manufactured after 1 January 2007 include the new headlights and 2.5 mph (4.0 km/h) bumpers, although they are hidden in the front. The Elise S is the new base model with a Toyota sourced 1.8 L (1,796 cc) engine replacing the previous models K series Rover engine. The 2ZZ-GE engine produces 189 bhp (141 kW; 192 PS) at 6,200 rpm (a considerable increase over the 120 bhp or 89 kW or 122 PS of the Rover engine). The inclusion of airbags, ABS brakes, electric windows, and carpet in addition to the new heavier engine has increased the base weight to 860 kg (1,896 lb) (approximately 85 kg or 187 lb higher than the previous S model). 2008 Lotus Elise R in Western Australia, Australia. The rare Lotus Elise California Edition near Tuscaloosa, Alabama, United States. For 2008, there were several additions to the Lotus line-up. There are three versions of the Elise. Lotus continued to provide a naturally aspirated Elise producing 189 hp (141 kW). The second version is the Elise SC sporting a non-intercooled supercharger producing 218 hp (163 kW). 0-60 mph is reduced from 4.9 for the base Elise or 4.7 seconds for the Elise with Sport package to 4.3 seconds for the Elise SC. The NA Elise styling is similar to the prior model years. The Elise SC, however, is distinguishable from the NA version by a rear spoiler identical to the Type 72-D edition spoiler and new wheels. Weight remained a Lotus-claimed 1,987 lb (901 kg); just 3 pounds (1.4 kg) more than the previous year. Prior to the release of the 2008 Elise SC, the limited production California Edition arrived at dealerships. A total of fifty California Edition Elises were produced; 25 in Saffron Yellow and 25 in Ardent Red. The interiors of the Cali's were produced in a light two-tone leather (Biscuit) and the exterior modifications included a silver front grille (a nod to vintage-Ferrari), body-coloured shutter grills on the side inlets and engine cover, enhanced 16-spoke wheels, and a large spoiler that covers the upper-rear deck (72-D style). The Cali's were intended to appeal to "the lifestyle market." In Europe, there are three models available; the Elise S with a 134 bhp (100 kW; 136 PS), 1.8L Toyota 1ZZ-FE engine and 5 speed manual gearbox (0-60 mph (97 km/h) in 5.8 s, top speed 127 mph (204 km/h)); the Elise R with a 189 bhp (141 kW; 192 PS), 1.8 L Toyota 2ZZ-GE engine and 6-speed manual gearbox (0-60 mph (97 km/h) in 4.9s, top speed 148 mph (238 km/h)); and the Elise SC with a supercharged non-intercooler 1.8L Toyota 2ZZ-GE engine rated at 217 bhp (220 PS; 162 kW) at 8000 rpm and 156 lb⋅ft (212 N⋅m) at 5000 rpm of torque, 6 speed manual gearbox and a spoiler (0-60 mph (97 km/h) in 4.3s, top speed 150 mph (241 km/h)). Several new colour options for 2008 were brought to the marketplace. These include new metallic colours (additional $590) Persian Blue and Liquid Blue; new Lifestyle colour (additional $1200) Isotope Green; new Limited Colour Level (additional $3,300) Candy Red, Ice White, and Burnt Orange; and the new Exclusive Colour Level (additional $5,100) Prism Green and Moonstone Silver. The following colours were discontinued for 2008: Nightfall Blue, Aubergine Purple, Magnetic Blue, Polar Blue, Autumn Gold, Chili Red, and Krypton Green. In February 2010, Lotus unveiled a facelifted version of the second generation Elise. The new headlights are now single units; triangular in shape they are somewhat larger than the earlier lights. The cheapest version in Europe had a 1.6 litre engine to comply with Euro 5 emissions, with the same power output as the earlier 1.8 136 PS (100 kW; 134 hp). The 1.8 litre Elise comes standard with a Magnuson R900 supercharger making 220 PS (162 kW; 217 hp). The 1.6 litre version was discontinued in 2018. The 2011 model was the last offered for street legal sale in the United States when the waiver from the United States Government's National Highway Traffic Safety Administration (NHTSA) for Lotus to build and sell cars in the US without smart airbags expired in August 2011. It was also the only Elise to use the Toyota 2ZZ-GE engine in the 2011 model year. Third generation Elise Concept at the 2010 Paris Motor Show. The series 3 Lotus Elise first appeared as a design study alongside the Lotus Esprit concept at the 2010 Paris Motor Show as the "Lotus Elise Concept" in the autumn of that year, and was set to be launched within the next couple of years. The car was heavier than the production model of that time, and had a considerably more powerful 2.0-litre inline-4 engine.The production model was then unveiled with many changes, including the downsizing of the engine to 1.6 litre and 1.8 litre (supercharged) and a different design with little cues taken from the concept. The Series 2 Exige comes with the same high revving Toyota 1.8L engine and six speed gearbox as the Elise 111R, replacing the Rover K-series engine of the previous Exige. The Series 2 Exige has been followed by the limited-edition Lotus Sport Exige 240R, incorporating a Lotus-developed supercharger atop the Lotus engine. The US Federalised version with the supercharger fitted is known as the Exige S 240. The Zytek Lotus Elise is an electric sports car that was jointly produced by Lotus and Zytek from 1998 until it was discontinued in 2003. Its 70 kg (154 lb) extruded aluminium space frame and lightweight composite body shell are factors in its low kerb weight of 875 kg (1,929 lb). 250 nickel-cadmium batteries provide 300 volts (at full charge) to two Zytek oil-cooled brushless DC motors, which deliver a total power of 150 kW (201 hp; 204 PS) and torque of 100 N⋅m (74 lb⋅ft). These motors are each mated to a single-speed, fixed ratio transmission with an aluminium gear. Its acceleration time from 30 to 70 mph (48 to 113 km/h) is 5 seconds, and from 0 to 90 mph (145 km/h) is 11.2 seconds. The car is governor-limited to 90 mph (145 km/h) to conserve charge. The range per charge is typically 100 to 120 mi (161 to 193 km) and the car can be re-charged within an hour. There is an example of the Zytek Elise on display at the Heritage Motor Centre. The Elise has received critical acclaim for its performance and driving experience, including Best Driver's Car 2001 (Autocar), Car of the Year 2003 (UK Horizons TV), and Best Sportscar 2004 (BBC Top Gear Magazine). ^ a b c Ben D'Cunha (28 June 1998). "Malaysian Lotus". New Straits Times. Retrieved 12 February 2016. ^ a b c "Lotus Elise assembly at Proton terminated". autoworld.com.my. 14 November 2000. Archived from the original on 16 May 2015. Retrieved 16 May 2015. ^ a b "Last 'Malaysian' Elise To Be Delivered This Month". autoworld.com.my. 9 December 2002. Archived from the original on 16 May 2015. Retrieved 16 May 2015. ^ a b c d e f g "Lotus Elise S1 1995 - 2001 Series 1 1.8". Archived from the original on 13 February 2008. Retrieved 6 March 2008. ^ "Lotus Cars USA: 2008 Lotus Elise". Group Lotus PLC. Archived from the original on 7 December 2008. Retrieved 12 December 2008. ^ Walton, Jeremy (2003). Lotus Elise: The Official Story. Motorbooks Intl. pp. 7, 95. ISBN 1-902351-05-3. ^ a b "Lotus Elise Model Comparison, Handling, Power". Sands Mechanical Museum. Retrieved 3 March 2009. ^ "Suspension". 4 February 2014. Retrieved 5 June 2016. The Lotus Elise has a kinematic roll center height of 30mm above the ground and a center of gravity height of 470mm. The Lotus Elise RCH is 6% the height of the CG, meaning 6% of lateral force is transferred through the suspension arms and 94% is transferred through the springs and dampers. ^ "My Other Design is a Lotus". Retrieved 14 August 2008. ^ "Chassis Number | TechWiki". Retrieved 17 August 2018. ^ "Lotus Elise 111s". Lotus Models. Lotus Esprit World. Retrieved 8 December 2012. ^ a b c "Lotus Elise R - Vehicle Description". Group Lotus PLC. Archived from the original on 17 May 2008. Retrieved 19 March 2008. ^ a b c "Lotus Elise S - Vehicle Description". Group Lotus PLC. Archived from the original on 17 May 2008. Retrieved 19 March 2008. ^ a b "2005 Lotus Elise" (PDF). Road & Track. Hachette Filipacchi Media U.S., Inc. August 2004. Archived from the original (PDF) on 21 July 2009. Retrieved 19 March 2008. ^ a b c d "Lotus Elise S - Dimensions". Group Lotus PLC. Archived from the original on 17 May 2008. Retrieved 19 March 2008. ^ "Elise S anchors Lotus lineup". Autoblog.com. ^ "2008 Lotus Elise SC". Group Lotus PLC. Archived from the original on 13 March 2008. Retrieved 19 March 2008. ^ "The new Elise - Improving on an icon". Retrieved 17 August 2018. ^ "Lotus Elise Model Guide". Retrieved 17 August 2018. ^ "2001 Lotus Elise S2 1.8 technical specifications". ultimatespecs.com. Retrieved 23 June 2018. ^ "Lotus Elise S2 Type 25". ultimatecarpage.com. Retrieved 23 June 2018. ^ "Lotus Elise, Engine Tuning, King K". www.sandsmuseum.com. Retrieved 4 April 2018. ^ "Lotus Elise Buyers Guide". Retrieved 6 October 2014. ^ "2008 Lotus Elise SC 220 and Elise California - Auto Shows (English)". caranddriver.com. November 2007. Archived from the original on 9 September 2010. Retrieved 26 December 2010. 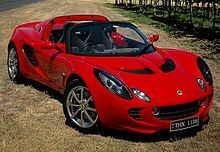 ^ "Lotus Elise SC 2008 review". carmagazine.co.uk. 10 January 2008. Retrieved 23 June 2018. ^ "Lotus Elise Club Racer Revealed With Less Weight, New 1.6L Engine [Geneva Preview]". AutoGuide.com News. 18 February 2011. Retrieved 4 October 2014. ^ "Lotus Elise and Exige Dead in U.S. This Summer, Leaving Only Evora Until Reinforcements Arrive". Car And Driver News. 20 April 2011. Retrieved 20 May 2015. ^ "Road Test: Lotus Elise 1.8 220 Cup 2dr". 1 June 2015. ^ "Lotus Elise Cup 250 Specifications". Lotus Cars. 20 March 2016. Retrieved 3 November 2017. ^ "Lotus Elise Cup 260 Specifications". Lotus Cars. 23 October 2017. Retrieved 3 November 2017. ^ "Lotus Elise Sprint: Less Mass Means More". Automoblog.net. 21 March 2017. Retrieved 28 March 2017. ^ "Lotus is back with a bang | Paris Motor Show | Motor Shows". Auto Express. Retrieved 10 October 2010. ^ "2008 Lotus Elise". Autoblog.com. ^ "Lotus Marks End for Elise and Exige with Final Edition". Automoblog.net. 8 August 2011. Archived from the original on 25 March 2012. Retrieved 4 September 2011. 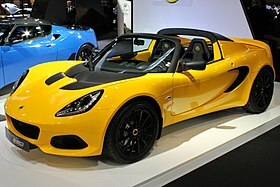 ^ "Lotus to produce Roger Becker Edition Elise and Exige". ^ "Lotus announce new Roger Becker Limited Edition Elise and Exige S". Archived from the original on 12 February 2015. ^ "Group Lotus Engineering Awards". Grouplotus.com. Archived from the original on 20 July 2008. Retrieved 10 October 2010. Wikimedia Commons has media related to Lotus Elise. This page was last edited on 18 February 2019, at 18:18 (UTC).